cochlear implant, evaluation, psychology, deafness, adult. Introduction: In the individuals with post-lingual deafness, one of the mostly questioned topics about the efficiency of the results of the implant is the time of hearing deprivation. In the cochlear implant group of HCFMUSP [Clinics Hospital of the Medical School of the University of São Paulo], we found implanted patients with long time sensorial deprivation, but not necessarily with poor audiological outcomes. Objective: To identify conditions of personality predicting good results in post-lingual patients with long-time hearing deprivation. Method: Retrospective study of cases series. We reviewed Wartegg's tests carried out prior to IC, in patients with post-lingual loss and who had hearing deprivation for longer than 10 years upon surgery. The test's results were related and compared to their auditory outcomes, two years after cochlear implant. Results: The deafness incidence and the time of deprivation do not interfere with the results. As for the conditions of personality, patients with good audiological results presented a well-structured ego, easiness for affective interchanges which favors the facing of difficult situations and concretization of ideas, besides spontaneity in the projection of their contents. Those who presented unsatisfactory results have not a very clear view of themselves, difficulty for interpersonal contacts, production according to their potential, poor level of assertion, self-aggressive tendencies in addition to no response according to the situations. Conclusion: The preoperative psychological evaluation may identify conditions of differentiated personality in patients with good audiological results, although they have a long-time deprivation. The cochlear implant is a device that benefits people with severe to profound bilateral neurosensorial deafness. It is an electronic equipment that contains an internal part implanted surgically and stimulates the auditory nerve directly through electrodes, and enables the acoustic signs captured by the environment through the external unit to be taken to the brain. The greatest benefit is the auditory contact with the world and the consequent improvement of the communicative quality (1). In the individuals with post-lingual deafness, one of the mostly questioned topics about the efficiency of the results of the implant is the time of hearing deprivation. In our cochlear implant group of the Clinical Hospital of the Medical School of the University of São Paulo we find implanted people with long-time sensorial deprivation; however they do not necessarily present with poor audiological results. In a research by GEIER et al (1999), the outcomes showed that the longer is the hearing deprivation time in the life of these individuals, the longer will be the time demanded for them to achieve the speech identification capacity (2). Nevertheless, upon approaching the benefits enabled to patients with postlingual deafness and long-time hearing deprivation by the cochlear implant, more recent studies describe another tendency. In 2003, HAMZAVI et al. reported the long-time hearing deprivation did not influence dramatically the results of such patients (3). The same conclusion was found by MAWMAN et al (2004) and HIRAUMI et al (2007), whose studies confirmed the efficiency of the cochlear implant for patients in the same conditions (4,5). In 2004, the United Kingdom Cochlear Implant Studies Group (6) pointed out that the risk of not much satisfactory results may be prevented by taking into consideration the time of hearing deprivation of the ear to be implanted in such patients; since they had profound deafness for more than 30 years they had poorer results in this study. According to YAMADA et al. (2005), it is necessary to take into account the emotional state of the patient and his/her family, because due to this factor, another moment may be deemed to be more prone for the implant (7). ZENARI et al. indicated a proneness of the individuals who lost their hearing at the adult age to take this experience as a source of psychic suffering, specially because of the feeling of inability to return to the social and professional life (8). SCHORN (2002) discusses, under a psychoanalytic approach, the development of the personality of children and teenagers with diagnosis of deafness. She stands out the hearing loss in children with acquired language is considered to be a traumatic situation for the child and for her parents. Upon receipt of the diagnosis, the parents may deal with feelings of blame resulting from the fantasy of not having taken care of their child, by becoming at times too protective in an attempt to supply what they cannot repair (9). Such behavior may leave bring deep impressions to the individual's psychism, by influencing their personality until the adult age as well as the responses to the implant. We have been observing there is no tendency in the results, which brings up factors, rather than the time of hearing deprivation, that may influence them, such as personality traits, motivation, language prior conditions or intercurrences in the personal life with emotional consequences during the process. In 2004, we presented a work called "egoic structure and its consequences in the post-cochlear implant" in the Seventh Argentine Congress of Otorhinolaryngology and Phonopediatrics NASRALLA and GOFFI (2004). The objective was to evaluate personality conditions of patients submitted to the cochlear implant who presented with good and bad audiological outcomes. Therefore, we applied the Wartegg test in four patients who had good audiological results and in other four whose results were not good. We verified that although all had suitable intellectual conditions, what differentiated them was in the ego structure and in the action drive. In the succeeded patients, the facing and overcoming of conflictive situations were always achieved, to which the resource of major flexibility, creativity, and adaptation to situations contributed. A patient was attended in psychotherapy in which it was possible to develop ambitions generating dreams that injected more vital energy to her, which was followed by a better performance in the use of the aid. The conclusion indicated that such qualities should be worked out in psychotherapy, in the pre-implant period, in order to obtain better results for the rehabilitation of these cases. In this work it was also possible to verify that the time of hearing deprivation did not interfere with the audiological results, because in both groups of patients there were deprivation times between 2 years and a half and 30 years (10). In the current work, the hypothesis is to evaluate whether the personality structure is more determinant than the time of deprivation in the results. We used the Wartegg test, that is a personality evaluation resource in which, according to FREITAS (1993), the individual projects his/her manner of perceiving, feeling and associating, and reveals the dynamics of his/her psychic structure (11). It was conceived by Ehrig Wartegg, who introduced it in the Fifteenth Congress of Psychology of Jena, Germany, in 1939, and published it in the work Gestaltung and Charakter (LEIPZIG, 1939 apud FREITAS,1993). It is a graphic projective technique that proposes to research the personality through drawings obtained in 8 pictures with predetermined graphic elements (11). The personality structure is divided into the following basic functions: emotion (expansive and retracted), imagination (combinatory and creative), intellect (practical and speculative) and activity (dynamic and controlled) (11,12). It features the observation, according to KFOURI, of the ego structure and the internal conflicts that will bring data about the individuals' personality base; how it deals with the human factors in its day-by-day, that is, the interpersonal relationship, as well as the adaptation or not of its ambitions and the possibility to face the external conflicts that will tell us about the vital energy, action drives and the fulfillment of its ideas (12). Each stimulus may provoke an idea as a Gestalt, a proper strength; and the Gestalt Psychology Theory is the theoretical reference picture for its evidence. Moreover, archetypical values are ascribed to the stimuli chosen, the reason why there is also a base from the Archetypes Theory by Carl Jung (FREITAS, 1993). The objective of the study is to identify conditions of personality predicting results with cochlear implant in post-lingual patients with long-time hearing deprivation. We carried out a retrospective evaluation of records with Wartegg tests applied before the cochlear implant in individuals with postlingual loss and time of hearing deprivation equal or longer than ten years. We surveyed from such records the deafness time data, deprivation time, age upon surgery and audiological results as for the perception of phrases in open presentation (GOFFI-GOMEZ et al., 2004) (13). Wartegg test was applied in the preoperative in a session, by using the test sheet and the interpretation carried out was according to the standards by KFOURI (1999), that allow us to observe the ego structure and the internal conflicts, how it deals with the human factors in its day-by-day, as well as its ambitions and the possibility to face external conflicts. The patients were divided into two groups: the first one of good results, considered with speech perception higher than 80%, and the second with unsatisfactory results, considered with speech perception equal or lower than 70%. The results of the test were analyzed and compared to the audiological results up to two years after implant. Seven patients were selected with good audiological results and 3 patients with bad results. 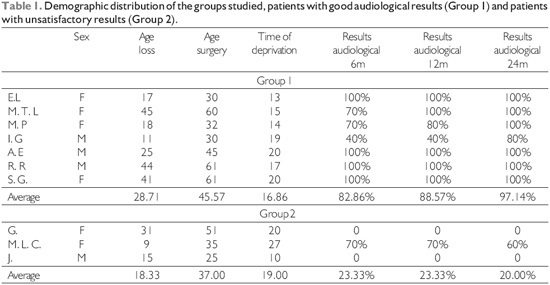 Table 1 describes the distribution of the groups of patients with good audiological results (Group 1) and the group with unsatisfactory results (Group 2) according to the age upon the deafness affection (in years), age of cochlear implant surgery (in years), audiological results of the phrases perception in open presentation (in %) in 6 months, 12 months and 24 months after the speech processor activation. - Recognition of the limits and needs with facility in the affective interchanges favoring the facing of hard situations and fulfillment of ideas. - Spontaneity in the projection of its contents. - Harmony in the personality. - Good representation of the affective and auditory stimuli. - Little contact with themselves. - Lack of interest in human relationships. - Production in disagreement with their potential. - For being not much assertive and/or self-aggressive. - In addition to not reacting according to the situations. - Lack of harmony in the personality. - Bad representation of the affective and auditory stimuli. Therefore, as for the personality conditions, the patients with good audiological results presented a positive self-image, awareness of their own role with good contact with their own reality, facility in the affective interchanges that favors the facing of hard situations and the fulfillment of their ideas, in addition to spontaneity in their contents projection, with good representation of their affective and auditory stimuli. Those who presented unsatisfactory results have a not very clear vision of themselves, difficulty in the interpersonal contacts, in the production according to their potential, low assertion, self-aggressive tendencies, in addition to difficulty to react according to the affective and auditory situations . Deafness offers several communication option to those who bear it: Lip reading, total communication, sign language (14, 15), that lead us to consider the choice of our individuals for the cochlear implant to be indicative of their desire to be according to their environment, because in this study we address the adult postlingual deafness, whose auditory losses affected them when they shared the hearing social relationships, even in the case of 5 patients with losses in the childhood or adolescence, whose parents and brothers were all normal hearers. The search for the implant in our sample occurred between 30 and 61 years old, which confirms the maturity and independence of the choice, or rather, did not confirm by any means whatsoever their families' interferences with their decision. By analyzing groups 1 and 2, in Table 1, what we observe is that the deprivation time, ranging from 10 to 27 years, does not offer traces about the results, and draws our attention the fact that 80% of speech understanding being a cut criterion and therefore, being included in the unsatisfactory results group 2, in M.L.C., we find the best performance in her group, however she has the longer deprivation time throughout the sample. Likewise, M.P. and I.G., from group 1, with 14 and 19 years of deprivation, have good results achieved more lately than others in the same group with a higher number of years without hearing before the cochlear implant. Table 1 also shows us the variability of loss acquisition and leads us to observe that the time of incidence of deafness is not a watershed, not even is the time of deprivation, which contradicts the data in researches by GEIER et al. (2) who state the longer the deprivation time in the life of these individuals is, the longer will be the time demanded for them to reach speech identification, because those with the longest times of deprivation in percentage corresponding to the years of life were the ones who more quickly had good audiological results, as shown by the tendency of the most recent studies, like that by HAMZAVI (3), who tells us the results are not influenced, in a determinant manner, by the long time of deprivation, as well as confirmed in the studies by MAWMAN et al (4) and HIRAUMI et al (5). Another fact that draws our attention is that, in group 2, the only participant with the time of deprivation of 27 years, with deafness when she turned 8 years old, and surgery when aged 35 years, is the one who had the best classification, as we already mentioned, despite she was included in group 2, due to the criterion chosen, and that is close to the result of 2004 of the United Kingdom Cochlear Implant Studies Group (6), that pointed out the risk of weak results being able to be avoided if we took into account the time of hearing deprivation of the ear to be implanted, considering that those who had profound deafness for more than 30 year (which is not her case, but only close to it, for she had 27 years of deprivation) had weaker results in this study. Considering YAMADA et al (7), as well as, in our pilot study, NASRALLA and GOFFI (10), in whom we detected some favoring psychic matters as for the post cochlear implant audiological result of candidates deemed to be qualified, and who, however, varied, as for the resource benefit, some not responding well to the process and others who in the first day could already hear and were positively emotional, we compared the result in the Wartegg test of our current sample, in which we sought to detect personality traits compatible to the success or failure after the cochlear implant. By analyzing the personality tests of group 1, we could observe that what told it from group 2 was the clearness they had of themselves, awareness of their own role, a positive self-image, with a good contact with their own reality, as well as an openness to human contacts. The respect to themselves and to their own competences, such as the ability to relate affectively led them to seek protection and help when they felt internally pressed, by heading to their needs. Being ego above all corporal (16) and deafness in adults thus an attack to the very ego, that causes discomfort and displeasure pointed out by ZENARI et al (8), giving them the proneness to take this experience as a source of psychic suffering, specially for the feeling of inability to return to the social and professional life, the possibility to rely on a well-structured ego and facility in the affective interchanges, favors the facing of hard situation and the objective action. Since "the ego has the habit of turning into action the id's will as it were its own will, by restoring the pleasure through the principle of reality and using reason and common sense" (p 39) (16) and, also according to Freud, "under the influence of the ego's self-preservation instincts, the principle of pleasure is replaced by the principle of reality" (20) (17), we consider that despite the areas relative to the ambition and facing of conflicts were eventually committed, there was the mobilization of effective defenses that allowed them to overcome the disadvantages. Such possibilities regarded the adaptation to scenarios, for instance, to social rules and concepts in a tough but formal manner that facilitated the acceptance of situations in which their degree of ambition would not allow them to reach; other times covering the difficulties with pleasurable feelings, adorns and aesthetic apparatus aiming at disguising their anxieties and difficulties of dealing and overcoming conflictive situations, able to proceed with intense internal work, what is possible to them by using sensitivity and perspicacity. Therefore, they are formal people, supported by norms, with good contact with themselves and with others, with empathy and sensitivity, other times by dependence, searching for defense mechanisms, possibilities to deal with conflicting situations and overcome them. At times we verify religious defenses working in favor of acceptance. Even if the patient does not have a good energy canalization, the dependence on the environment also makes him/her move, accept, face and overcome the obstacles. In group 1 patients we verify a harmony between the perception and the representation of the affective stimuli, with high power of symbolization. In addition to the spontaneity in the projection of their internal contents. At last, very spontaneous projection of their internal contents, with suitable perception of the stimuli as a representation of themselves, in the ego structure, the acceptance of themselves, the maintenance of good contact with their own interiority and with evident interests in the affective relationships, which mostly united them. These patients presented with a clear consistency of personality with recognition of the limits and needs, which made them search for the solution of their problems, many times regarding the matter of becoming more dependent and adapted to the rules and standards of their groups, with a strong commitment to the ethical values, such as in other cases with getting around the facing of conflicts above their own capacity of overcoming the obstacles, which confirmed the respect and knowledge of their own possibilities. They also presented with restrict ambitions in the family limits, with tacit acceptance of their role, by remaining within what the reality offers to them. On the other hand, in one of the cases, in which evasion to drives was not made for excess of conscious control, with sufficient canalization of energy, there was an impossibility of independence, and he/she needed to be guided; they are satisfied with too little, or with is important to them, namely, the protection of home, their major ambition, without too much intellectual capacity. Such conditions show us they are in line with themselves, without conflicts. At last, no matter what their intellectual capacity or socio-cultural level could be, what told them the most and allowed them to achieve their objectives was the acceptance of their own reality and their own resources, such as the good contact with themselves and the human interests. "Every moment, the behavior of an individual is determined by a structured set that comprises the individual and his/her environment, this totality is the vital space that included all facts that act on the individual, whether they are physical or social, conscious or unconscious. This field is dynamic, every behavior seeks to reestablish the broken balance between the individual and his/her environment, and this rupture is the source of tension" (p. 11-12) according to FRESI, apud FREITAS (1993) (11). "In the Wartegg test, carried out by the individual, he/she expresses his/her set of perception concerning each stimulus and its representation. The manner in which he/she realizes the stimulus informs his/her way of living with the specific vital area. The representation supplies the way how he/she behaves whenever he/she is stimulated in that determined area. The perception expresses how it receives the activated area and the representation demonstrates how it behaves in this situation; each stimulus of the test was prepared considering its Gestalt and shows their own qualities of shape, sizes and placement in space" (p. 13) (11). What mostly draws our attention in group 2 is the low or void representation of the affective stimuli, which, by the way, corresponds to the low or void representation of the auditory stimuli. There is a disharmony of the personality because they do not react according to the situations, with a not much clear viewpoint of themselves. They are people who do not communicate their affection well, with difficulty of contact, without affective involvement, spontaneity and genuine interest in their relationships. They lose their structure faced with threats and difficulties and do not overcome obstacles. With difficulty to draw a destination and to take a direction, by blocking growth drives, with regressive or self-aggressive tendencies, with badly worked anxieties and without action impulse. In spite they have desires and capacity of fulfillment, they many times deny them, which in association with their affective problems keep them from working negative feelings and they get around the facts which prevents them from emotional involvement and let them without vital energy and results in an existential emptiness. Therefore, we could observe a link of the auditory rehabilitation success to the conditions of their own individuality apprehension, the clear recognition of themselves, interests in the human relationships and acceptance of their possibilities, which allows the search for support when necessary, which enables them to face their difficulties and the bearers of failure in auditory rehabilitation represented mainly by a low capacity to have contact with themselves, confirming a lack of proportion between possibilities and desires, due to the self-aggressive and lowly constructive tendencies. In addition to not being enough conscious of their values, they get away from affective relationships. This work confirmed there are differential personality conditions between the patients with good audiological results and with unsatisfactory audiological results, with a long time auditory testing, that may be identified in the preoperative psychological evaluation. Such results will provide us with predictive data of the audiological rehabilitation. The preoperative psychological evaluation may identify different personality conditions in the patients with good audiological results, even with long-time hearing deprivation. 1. Psychologist of the Cochlear Implant Team of HCFMUSP. 2. Doctoral Degree in Communication Disorders Sciences at UNIFESP-EPM. Phonoaudiologist of the ORL Clinical Division of HCFMUSP. 3. In Graduation Course of Psychology at PUC-SP. Collaborator of the Group of Cochlear Implants at HCFMUSP. 4. Master's Degree in Communication Disorders at PUC-SP. Phonoaudiologist of the Group of Cochlear Implants at HCFMUSP. 5. Doctoral Degree in Otorhinolaryngology at FMUSP. Assistant Physician at the ORL Clinical Division of HCFMUSP Coordinator of the Cochlear Implant Team at HCFMUSP. 6. Post Doctoral Degree at FMUSP. Assistant Professor of the ORL Clinical Division of the HCFMUSP. 7. Head Professor of the ORL Department of FMUSP. Institution: Hospital das Clínicas da Faculdade de Medicina da Universidade de São Paulo - HCFMUSP. São Paulo / SP - Brazil. Mail Address: Heloisa Romeiro Nasralla - Rua Capote Valente, 432 - Conj. 14 - São Paulo / SP - Brazil - Zip code: 05409-001 - Telephone: (+55 11) 3898-2210 - E-mail: dhrn@terra.com.br. Article received on September 5 2009. Approved on October 9 2009.